Cette révolution littérale, close sur elle-même trace le glissement de la topographie vers la psychologie et inversement. Ces hommes sont des détenus et ce parcours répété révèle l'intégration, même inconsciente, de leurs trajectoires circonscrites dans l'univers carcéral et leur conditionnement spatio-temporel. 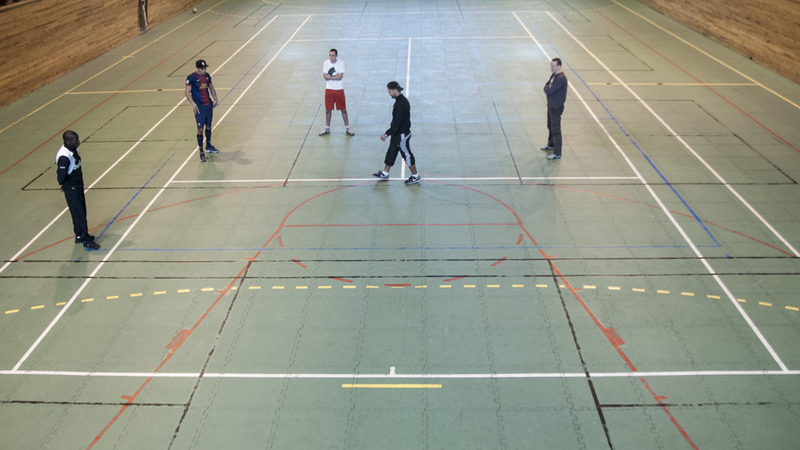 A court in a sports hall. A group of men in movement. An unremarkable scene simply disturbed by the strangeness of the repetition of the same actions, the same circuit. Following the lines of the court, a man goes tirelessly round and round a small area, in a sort of submission to this spatial organisation. This literal revolution, self-contained, traces the shift of topography to psychology and vice versa. These men are prisoners and this repeated circuit reveals the integration, even if unconscious, of their circumscribed trajectories in the prison world and their spatio-temporal conditioning. This submission to a disciplinary structure, both physical and mental, also paradoxically presents a way to re-appropriate time. This systematic pacing is time in action: measurement by walking, a tangible experience of the passing of time. It evokes the unbearable stretching of time felt by the prisoner and existence in a cell, worn down by boredom and waiting.